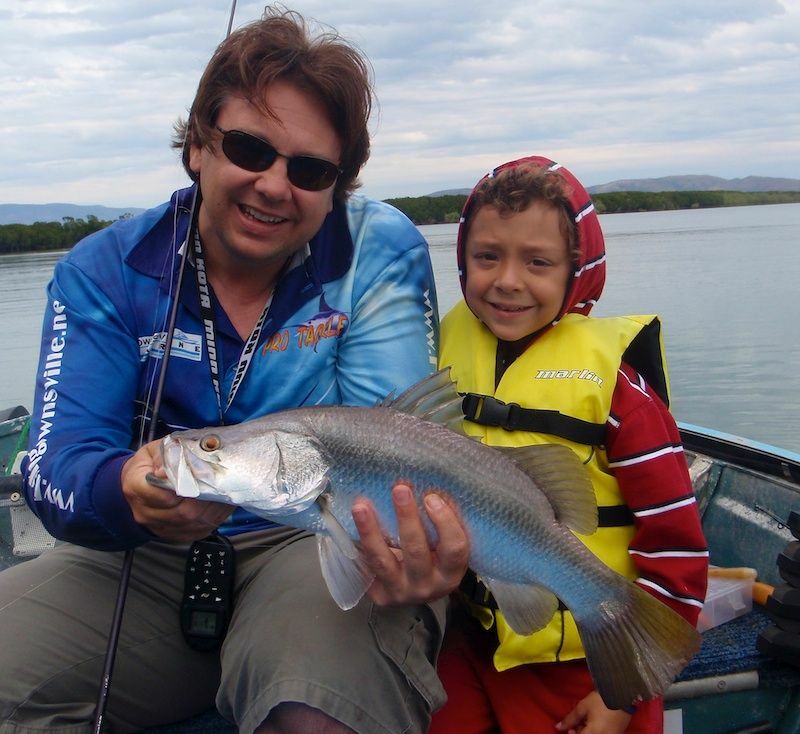 The kids have been bugging me for the last few weekends to get them out in the 'little boat' to chase some Barramundi. They had soccer games yesterday morning that prevented us getting offshore, so with the wind coming back up today I thought it would be a good chance to get them into the creek. The plan was to allow them to work the Thready Buster lures in the deeper holes where Andrew and I had caught a stack of Salmon the weekend before. At least it's open water and pinpoint casts into the snags don't matter. So we headed off about 7am to catch the last of the run in tide and first of the run out. We marked a few fish in the hole when we arrived, but nothing like last weekend. Spot-lock was hit on the iPilot and we all started working the Thready Busters. 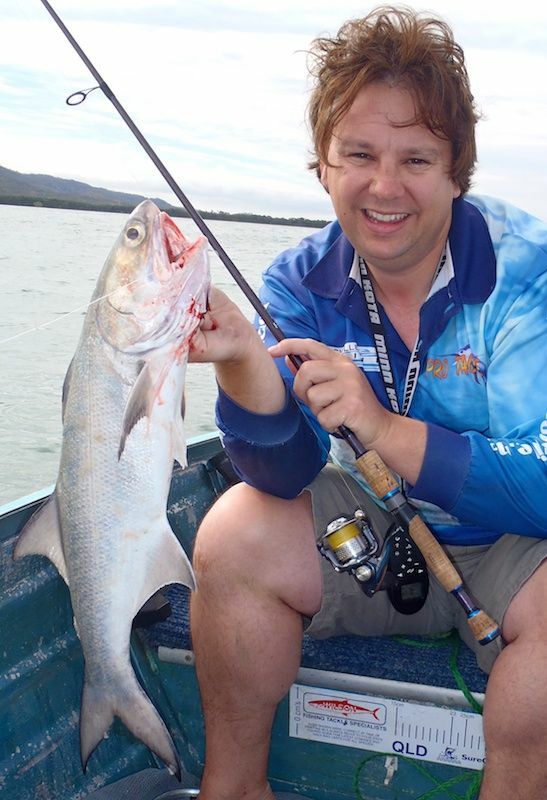 I was first to hook up, a solid fish that I 'just' caught a glimpse of before the hooks pulled. It was very quiet compared to last week, but were persevered. 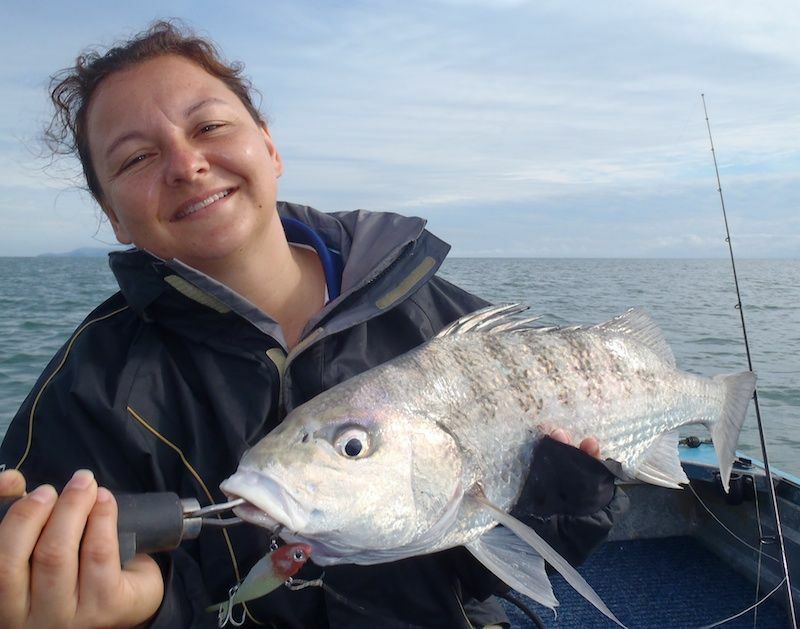 Tania eventually nailed a good fish that had her moving all around the boat. 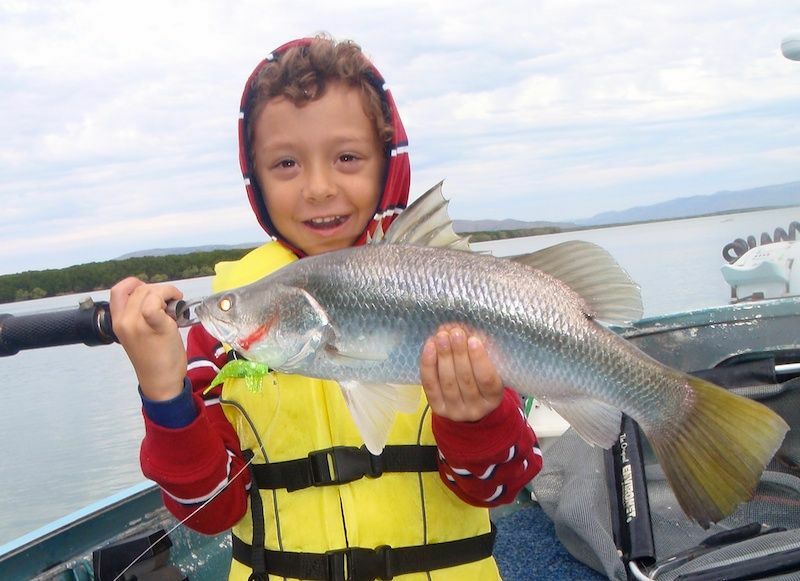 We had not idea what this was going to be as it didn't fight anything like a Salmon or a Barra. Soon a nice Grunter came into view and was slipped into the net. The next decent fish to hit the lure was a nice size Salmon. A much better quality fish than last weekend, it danced all over the ocean. A couple of tense moments and it was in the net. Just in time too as lifting the fish from the net the leader broke from the wear of the rough mouth. The Thready Buster was well down his gob! I missed another couple of hits and landed a smaller Grunter. But the wind was coming up and it was getting cold and rough where we were sitting. So the decision was made to head back into the creek and find another spot. I wanted to stay with the Thready Busters in the deeper water as it is much easier for the kids. But after a flash of a Barra on a Thready I threw colse to the mangroves, I just had to change over. I tied on a DOA and threw it back into the mangrove roots. Two nice silver fish flashed and fought over the lure, but both missed. Back it and 'whack', Barra on. 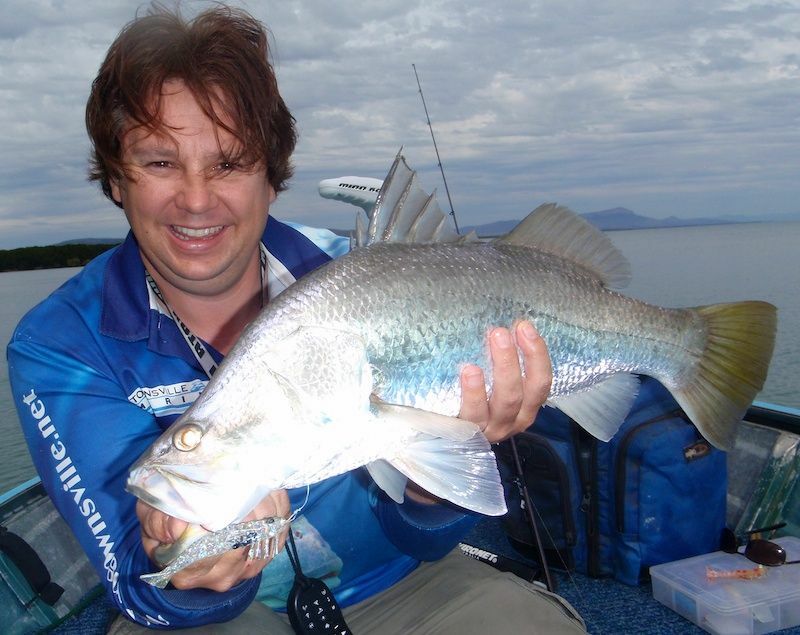 The little 55cm fish thrashed on the surface before being netted and released. 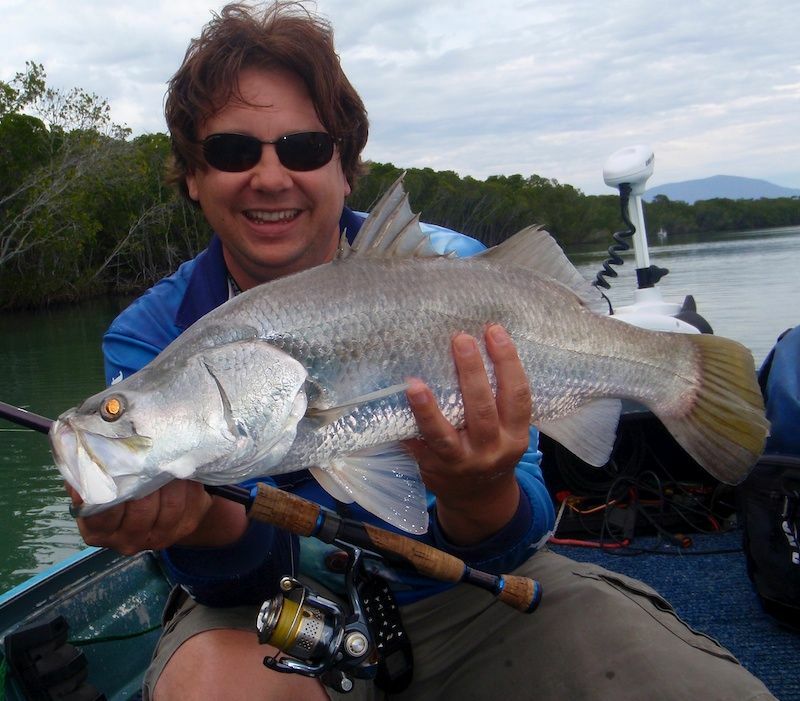 Over the next hour we pulled at least a dozen Barramundi out of this one set of mangroves. Most were in the 55cm class, but I did manage 2 that went 63cm. The kids nailed plenty of the smaller fish, but I had to put the cast in do the hookup for them. 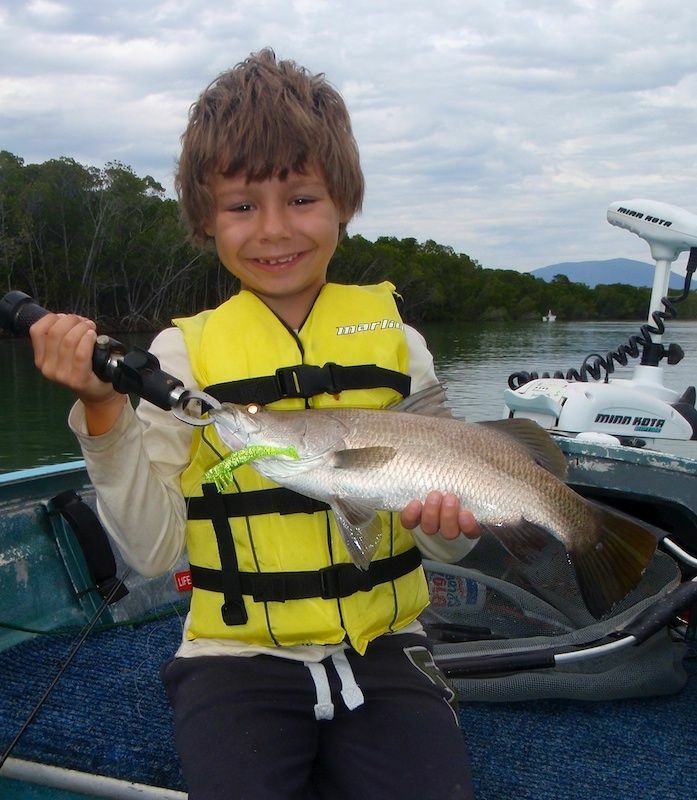 It was just too tight around the mangrove roots for the boys to successfully work a lure. The DOA's are not exactly snag proof! A great morning on the water overall. Water temp is back around the 23 degree mark and was running beautiful and clear. A few meals of fish this week! Lucky the whole family enjoy eating fish. DOA lures are only $20 for 5 at ProTackle. Right on the front counter. 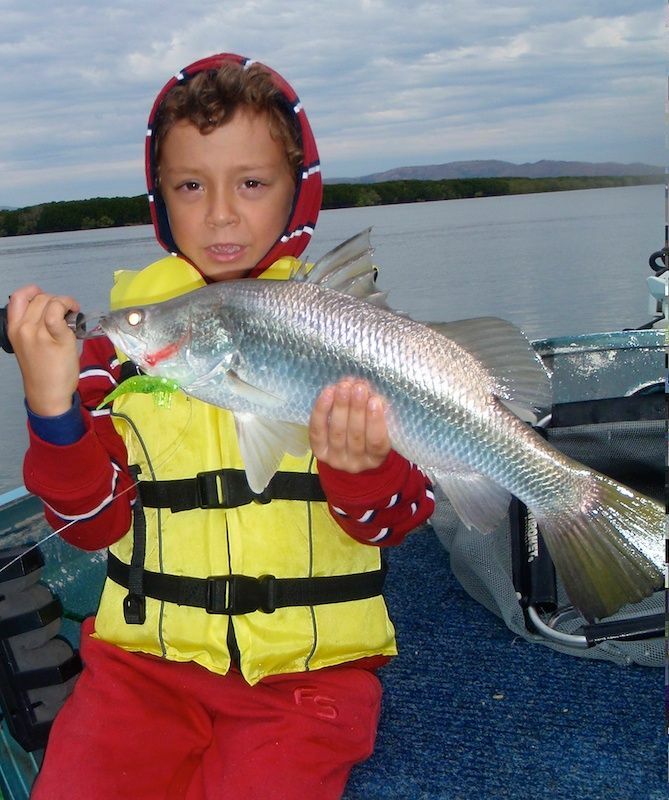 They are good to as they are or you can upgrade the hooks if your fishing heavier line. Ask Matt about the best hook! They are available in 3in and 4in sizes, but I only by the 3in now as its my favorite.